Signing up for a Dub is easy and straight forward. If you haven't done yet already, take yourself to our sign-up page, which will look like screenshot 1 shown below. You can sign-up using one of your existing social media accounts or you can sign up using email and password. After filling out the form in screenshot 1, we will send you an email to confirm your account with which you can complete your registration process. Be sure that you check your SPAM folder just in case that email somehow eneded up in there. 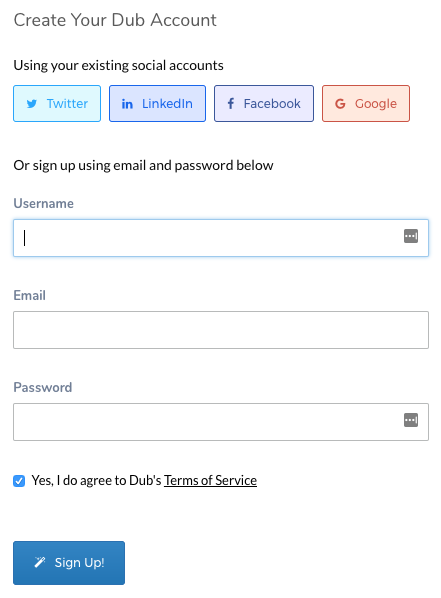 Once you have completed the registration process and sign into Dub, you will be greeted at the homepage as displayed in screenshot 2. The site that you just logged in is what we usually call Admin Site or Admin Panel. This is the place where you will manage all your domains and configure how they are parked etc. It's time to get familiar with all the things that Dub has to offer. But before diving in, note that you can always change your account details by clicking on your username on the top right hand corner of the page. Let's now start using Dub for what it's good at and we're going to start by adding & importing domains to Dub. Next : Ready to add your domains to Dub?